Lumiotec announced new "natural white" OLED lighting panels (P06 panels) that feature the world's highest color rendering index (Ra93*1, a CRI of over 90). This is very close to natural light, and Lumiotec targets high-end retailers and museums. The panels come in five different sizes (up to 14.5x14.5 cm in size) and cost between ¥13,000 ($165) and ¥40,000 ($508). 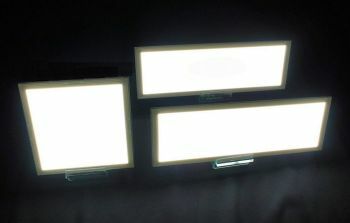 The panels feature an efficiency of 28 lm/W, and Lumiotec told us that they use a hybrid design, comprising of both fluorescent and phosphorescent materials (provided by UDC). We do not know what is the exact mix. Lumiotec signed their license agreement with UDC back in April, and are already producing pure-phosphorescent panels, the P5, which feature 40 lm/W. Lumiotec says that the P06 panels have not only achieved a high color rendering index of Ra93 but have also realized high-level reproducibility for all colors, including red and human skin tones (Asian and European) color. The OLEDs do not emit any ultraviolet or infrared rays - which is also important to prevent damage to objects being lit. Lumiotec told us that they are hoping to sell around 15,000 panels in 2012, from all types. The company is confident that they can reach their target based on the sales they achieved in 2011. Lumiotec's production capacity is about 50,000 yearly panels.